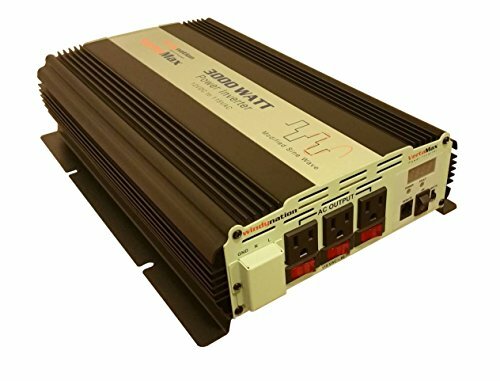 The WindyNation VertaMax 3000W Modified Sine Wave Power Inverter provides household power on the go! It converts 12 volt battery power to 115 V AC household power, allowing you to power up office equipment and household appliances from your vehicle or any 12 volt battery. This unit is ideal for appliances such as microwave ovens, coffeemakers, laptops, TV sets, video games, CD players, DVD players, cellular phone chargers and much more! LED Display shows DC battery voltage and Watts (AC power consumption). Monitor power usage and battery voltage. 1 year warranty. Reliable design with thermal shutdown, reverse polarity protection via internal fuses, short circuit protection, over-voltage protection, low voltage shutdown, and low/high voltage alarm. The VertaMax 3000 has 3 grounded AC outlets (115 AC for USA household devices). Each AC outlet has its own circuit breaker (red switch below each outlet). Typical examples of appliances that can be powered by this inverter: computers, televisions, video game consoles, cell phone chargers, microwaves, air conditioners, and the list goes on. If you have any questions about this product by WindyNation, contact us by completing and submitting the form below. If you are looking for a specif part number, please include it with your message.